I am new here and I heard quite a lot about Affinity Designer. I am thinking of getting a Mac mainly for that program. I just want to become more familiar with how the layers work as there are only two things right now I'm a little confused about. 1. From the different video tutorials I've watched, the structure of the layers appear differently for each video. There are two different structures. Here, each layer can be expanded and show the paths within the layer (which I'm use to.) But then here, when the man creates a new document, each path is it's own layer. So how does this work? How can there be two different structures? 2. I know this bends the rules of vector designing, but I don't always draw in closed paths. As a cartoon character designer, I prefer to draw more freely. So my question is, seeing how there is a pixel persona and the option to clip layers, is there a way to use the bucket tool to fill in overlapping paths done with vectors (fingers crossed)? In Affinity Designer, each vector object is on its own layer, but layers can be grouped or nested (creating "child" layers). 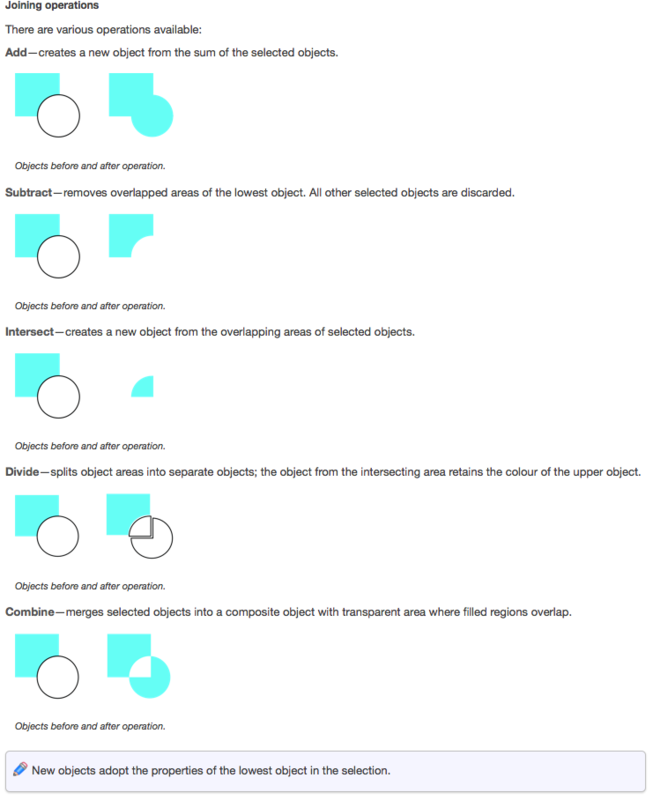 Groups & 'parent' layers can be expanded to show their individual layers but each individual vector object must be the only object on its layer, so it can't be expanded. Open paths have no 'inside' so they can't be filled with color using the bucket tool; however, the the path can easily be colored by changing the color of its "stroke." 1. A vector object is considered an object layer type. Similarly to text objects, image objects, shape objects etc each one is represented by a layer in the Layers panel. Additionally you can create a generic layer where you can nest all those objects. This layer can be expanded to show the nested childs/objects. 2. No, you can't use the Flood Fill Tool directly over overlapping vector objects (closed or nor) to fill them. Each vector path (in case of open paths) remains independent of each other and currently Affinity can't detect the boundaries created by them to fill in the space keeping them as vectors (like Live Paint do in Illustrator). You would have to group the paths, then rasterise the group to flatten/convert to a pixel layer and only then use the Flood Fill Tool to fill the empty areas, losing their vector editability in this process. Thank you for the feedback, people. 1. Well then it looks like that's what I need to do with the layers. I'm an organization freak, you know? 2. Aw that stinks. I hope this feature is considered for the future. It's one of my favorite features, and I love the way DrawPlus approached it. bleduc, I obviously did not understand what your second item was all about but it reminded me of a sort of related open path limitation of AD that affects my own (lame, amateurish) style of drawing cartoons: I like to start with a combination of open & closed curves & use the Boolean geometry operators to combine them into the shapes I want. The problem with that is in AD the Booleans ignore open paths, so for example I can't divide a closed curve into several pieces by drawing open paths through it & or add several intersecting open paths together to create a new closed curve. There is a partial workaround for that but it is tedious: AD can expand a stroke into a closed curve so if I do that to all the open paths I can use the Booleans, but it leaves a lot of extra shapes & gaps that I have to clean up afterwards. Could you please explain more in how the Boolean feature works? I looked it up briefly, but I'm not sure I understand. Also, what Pixel Persona tools can detect vectors? I ask because I wonder if I can do the following. Let's say I made linework in a vector layer. Then I create a pixel layer for the fills. Since the paint bucket tool can't detect pixels in vector layers, I wonder if I can create fills by using that selection brush by making selections inside my outlines, and then make my bucket fills in the pixel layer. I see that there is an "All Layer" option in the context toolbar when the selection brush is selected, so I assume that one might be able to detect the vectors. If I can do that, I'll be pretty darn happy. One way to work around this is to loosely draw closed shapes behind the outlines (strokes) and fill them with a base colour. You can then use other shapes clipped inside the main shape (layer clipping) to work on the shading. There was already a few discussions around this subject like this one, but overall i think that with the current toolset, closing the shapes and clipping others inside them for shading is a good approach which you can then complement with brush strokes for detailing work (or even for filling large areas with texture). Regarding your question, yes the Selection Brush Tool can detect vector's edges, and you can then paint the selections with the Flood Fill Tool (after creating a new Pixel Layer), but it may leave a few jaggies here and there and may imply some work depending on the type of illustration and stroke's width you use. Make sure you create a document a little bit larger than you need so you can downsample it later as a way to hide/fade the jaggies in needed. Regarding Booleans, I have attached a screen shot of part of the Joining objects help topic as a reference. Except for Divide they require that two or more vector objects be selected. It seems that today they are working with both open & closed paths so ignore my comment about them ignoring open ones. I don't know if this was added to the 1.4.1 update or what but one thing I noticed is they close open paths when applied so I need to figure out how that would affect my work. One consequence of that is they canl close multiple open paths in one operation, even if they don't overlap. Closing is done in the usual way with a single straight stroke between the beginning & end points of each path, so that might be useful in some situations. So that's a yes on the selection tool. Great! Oh so they're like pathfinders. I get it now. Thank you. I imagine that would be a pretty tough technique to use on open paths, but hey, it's what ever works for you. I don't know if I worded it funny on my original post, but can the bucket tool also detect vectors as long as it's on a "pixel" layer? I may have made it seem like I meant vector layer originally. Unfortunately, I am still a long way from figuring out what works best for me for things like this. I have discovered that the selection brush does work on a pixel layer with the 'all layer' option enabled to make pixel selections in the intersections of overlapping open paths or closed shapes, sort of like what you posited in an earlier post, but (as you probably have guessed) this isn't very useful because anything filled in is on a pixel layer & thus is not resolution independent, making it kind of pointless to apply it to vectors. Thank you for that... however, I've come from Illustrator, where you can draw two wiggly lines, finish the end of one near the end of the other, and use Command J to join them. When I'm drawing complex maps, and I need to rest my hand, it works well. How can I do this? This is a real world problem, and I wonder if I'm missing something obvious! You can join paths, there is a button in context toolbar. There is no other command for it, I don't know why. In my test it works a bit unexpectedly compared to illustrator. You also can of course use fill in unclosed paths just normally. Ah yes, you ARE right... it certainly works unexpectedly! Once I quit and restarted AD it worked fine. Thank you for your prompt reply. Much appreciated... currently drawing geopolitical series of maps of Europe in run-up to WW2. I'm learning graphics AND geography! I haven't found a keyboard short cut. You need to select the paths in node tool mode, click the join curves widget, and then the click the close curves widget. The join will draw a line between 2 end points, the close curve draws between the other 2. If you have a closed object, and break it at 2 points, the close curve will create a line between the ends of the 2 new objects. Currently you can already set shortcuts for Break Curve and Join Curve operations. In the Keyboard Shortcuts section (Preferences), set the first dropdown to Draw and the second to Node Tool to find them. Thanks for the tip, Miguel. I was a little disappointed that I couldn't find these commands on any of the menus, but keyboard shortcuts are probably more useful anyway. Thanks, great! I was getting pretty good at clicking the widgets, but keyboard short cuts should save me many seconds. Obviously, I still have many things to discover. I use Shift+B & Shift+J for this. Easy to remember & relatively easy to type with one hand. I didn't even realize it didn't, but I guess it's not a huge problem since it can be done individually. Hopefully this will be addressed at some point. The Join Curves command still doesn't join all nodes either (start points). Break Curves is straightforward and unambiguous for a multiple selection, but Join Curves is often rather less so. I'm sure that after the features on the roadmap come into the commercial version of Designer, there will be more room for the extra things to be handled with. I imagine it can be overwhelming to address the main principle features graphic designers use, and still make room for the extras that are asked of people. Although everything is considered, I reckon that the workload can be awfully pressureful. I've finally had to break with Freehand (Illustrator is not a serious vector program, being bloatcode, and selection is semi-crippled)- I have 2 problems with Affinity Designer. 1./ I have a 36 page document I started in FH - I could control all the elements of this drawing with about 15 layers in FH, for example, I may want to switch off 1 type of text in all the documents - 1 click. In Affinity Designer every path automatically gets it's own layer. Most pages in this document have easily 1000 paths. That means in AD I now have to sift through 36,000 layers. This has to be done through a palette, which acts as a kind of keyhole through which these layers can be observed. Now, if I want to turn off the text on the pages, is there any other way than sifting through 38,000 layers? 2./ When I have two paths totally coincident, and I want to deselect both, (because there is a 60 paths object selected in front of them that I want to isolate) - shift deselecting the top path switches it off, then clicking again reselects it rather than deselecting the lower layer. If this is impossible, I will not be able to use Affinity Designer. Hello Imagineer, and welcome to the forums. I will see if I can help with your concerns. You are correct that each path gets its own layer (curve), but not if you click the New Layer button and add all those curves in one (Child Layers). That is what I am use to. Just make sure that when you drag the curves into a layer that you do not accidentally drag them into a curve. Then that will create a clip. Affinity Designer does not support multiple pages, but that feature will be coming in version 1.6! To avoid several curve layers, you should probably open Freehand back up, and instead of having your objects organized by page, organize them each in their own layer set (child layers). 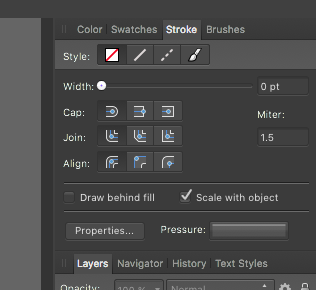 Affinity Designer's layers may not appear the same as in Freehand or Illustrator, but it will keep them organized in individual layers as long the program the files imported from were organized in their own layers. Imported objects usually get masked which results as a sort of group. Holding Ctrl for Windows or Cmd for Mac can select paths individually. This is the same for groups and clipped objects as well. When you have an object selected, tick off "Scale with object" in the Stroke studio or Stroke fly out from the context toolbar. On question 2 - in Freehand, if you have say 3 circles, one on top of another, and they are all selected, you can "drill" down to them by simply multiple clicking and FH will switch them off in sequence. That doesn't work in AD - have tried the Ctrl or Command, AD selects the top, switches off the other lower layers and you cannot switch the top layer off. If your selection is of a large number of elements, and you are simply switching off the elements you don't want, you cannot release the shift key, the elements you don't want have to deselect without releasing the shift key or you lose a few minutes of selection time.I can't stress enough how important this FH ability is, because, at least in keyline view, it makes the most complex selection/deselection a breeze. This is the single most important reason I don't use Illustrator for complex work or work I need done quickly (apart from Adobe's toxic ecosystem). On question 3 - If you say have an object with 10 vertices(points), and you want to translate 6 of them, leaving 4 of them in their present position, can you do this without leaving the node tool? Or do you have to go into the move tool for the scale? If so, you lose the vertex selection and you can't do what's needed since vertices don't stay selected in the move tool. In other words, you need to be able to perform scaling, shear, mirroring - translation work in the node tool mode. The shear and rotate input boxes are greyed out in the node tool, but that's exactly when I most want them. Thanks for your quick help, and AD has given me the most hope I've had since Adobe squashed FH - AD clearly has some of FH's street smarts. ps. How do you retrieve things you've pasted inside something else? In FH that's command/shift/X - is there an AD equivalent? Have not been able to find this anywhere!